Syrian intelligence forces say that they have captured a haul of medical supplies near Aleppo that came from Turkey and was destined for Daesh terrorists in the Iraqi city of Mosul. In a video released by Russia’s RT television network on Friday, Hussein al-Omar, a colonel in Syria’s Military Intelligence Directorate, said that the lorry, loaded with some 25 tons of medicine and hospital supplies, including a number of dialysis machines, had entered Syria from Turkey’s Bab al-Hawa international border crossing, located on Syria’s northwestern border with Turkey. He added that the lorry was planned to reach Mosul, Daesh’s de facto capital in Iraq, through the towns of Afrin, A’zaz, and Manbij in Aleppo province. According to Omar, the lorry, loaded in Turkey, bore a Syrian number plate and was driven by two militants from al-Qaeda-linked al-Nusra Front terrorist group, who had received the cargo in the Bab al-Hawa border crossing. “Through an intelligence operation, we lured them from Afrin to Nubl, arrested them, and brought them here. All of this proves that Turkey is supporting the terrorists, especially Daesh, with meds and all supplies, even with weapons,” the Syrian official further said. 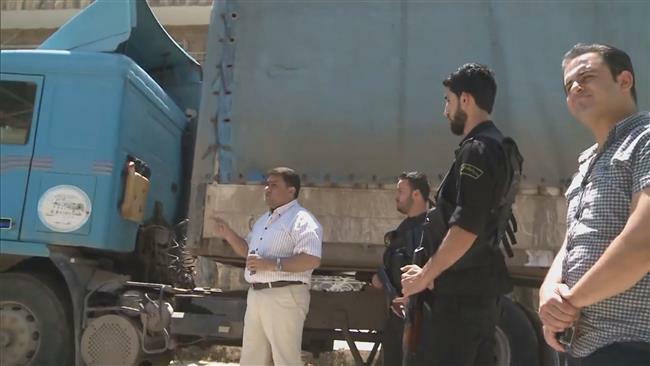 The much-needed aid would be delivered to Aleppo’s local maternity hospital, which sustained damage in a recent shelling attack launched by the Takfiri terrorists, he added. Turkey has time and again been accused of aiding and abetting militant groups operating in Syria with reports saying that Ankara actively trains and arms the Takfiri militants there, and facilitates their safe passage into the Arab country. Ankara has also been accused of buying smuggled oil from Daesh. Last year, Russia released satellite images showing long lines of trucks carrying oil from Syria’s Daesh-controlled parts into Turkey. Ankara, however, has rejected the allegations. Syria has been gripped by foreign-backed militancy since March 2011. The United Nations Special Envoy for Syria Staffan de Mistura estimates that over 400,000 people have been killed in the conflict, which has also displaced over half of the Arab country’s pre-war population of about 23 million.